Have you been wondering what to eat on those hot summer afternoons? Well, wonder no more. When you visit SURA Korean BBQ, your taste buds will be delighted by the fresh, spicy delight of our Bibim Naeng-myun, a.k.a, Korean cold buckwheat noodle served with a red chili paste. Our recipe is simultaneously traditional yet unique, making it the best version of this fantastic Korean noodle dish that you can encounter. Traditional Korean cold noodle dishes are an age old delicacy. The widely accepted serving method is a stainless steel bowl to keep the dish as cold as possible. 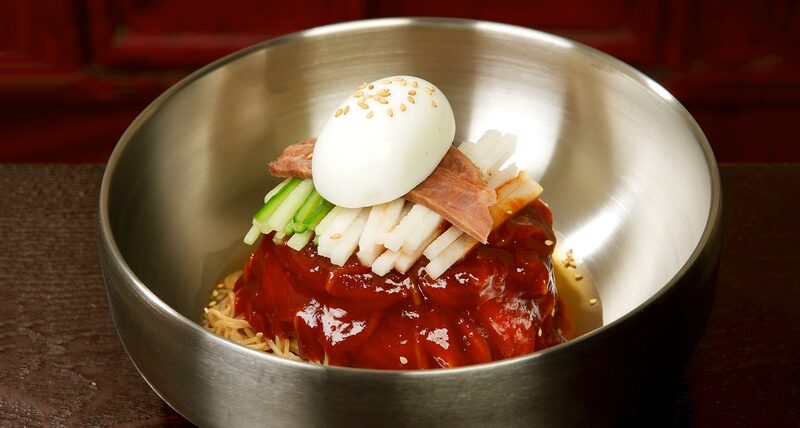 Most Bibim Naeng-myun will feature julienned cucumber, boiled egg, simmered-then-cool-down beef, and Korean pear among the buckwheat noodles and icy dressing. The red colour you see in the image above comes from house-made authentic Korean style red chili paste, which gives our Bibim Naeng-myun its spicy yet slightly sweet flavouring. While we cannot give all our recipe secrets away, we urge you to come discover just why true Bibim Naeng-myun aficionado are raving about this dish. There is no better time to try Bibim Naeng-myun than in these hot summer months. Stop by SURA Korean BBQ for lunch between the hours of 11 AM and 3 PM, and order Bibim Naeng-myun, or as part of our wildly popular Lunch Set Courses.